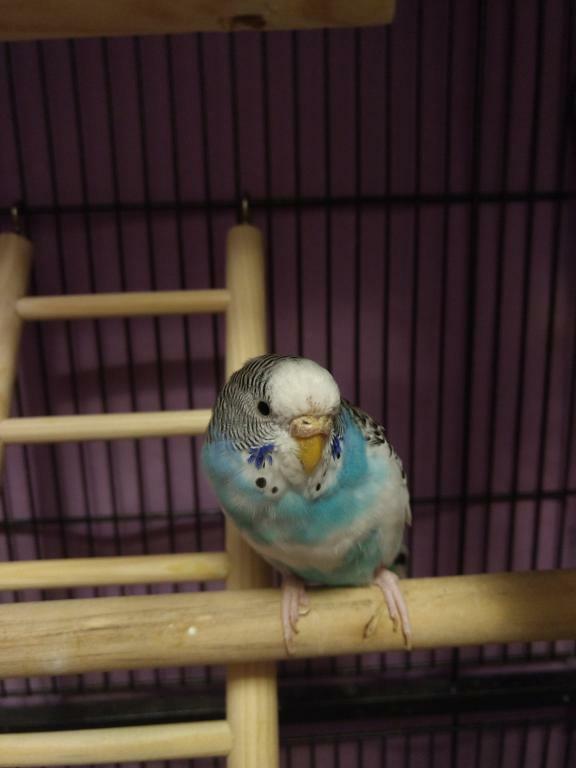 Is it normal for a female budgie's cere to look like this? I'm worried because it doesn't look as clear.. I think she might be moulting, because I've found a few big feathers at the bottom of their cage in the last few days. She is acting normal and eating fine, and our other budgie (they share a cage) looks normal and healthy. I cannot open the link to your pictures and the thumbnail picture is not too clear. She does look like she is molting but I cannot see enough detail on the cere to comment on mites. How old is this bird? Sometimes in older females you will see what is known as hypertrophy of the cere, this is a hormonal issue where there is excess layers of tissue on the cere and can look a bit flakey. Sorry! Do these links work? She is about 2 years old, maybe a little older. Should I take her to the vet for this? I think I would have her examined by an avian vet, it could be mites but her cere does looked thickened, which in itself is not a problem unless the overgrowth begins to block the nares. Better safe than sorry, if it is mites it will not clear up without treatment and best to start that right away if it is determined to be the problem. Okay. I also read that the female's cere can become thicker when she is in "peak breeding condition".. could this also be a possibility? I know that for the past week or so, she has been kicking out A LOT of her seeds every single morning, and I heard that could mean she is trying to nest in the food bowl? That's also where I find her every morning when I uncover her lol. The cere is definitely thickened, but as Cody mentioned that in itself is not a problem as long as the nostrils are not blocked. I can’t tell if there is also a mite problem starting. Best to take to an avian vet to be sure. Maybe others can see better if there are signs of mites starting. It’s good that you’re looking at these small details . I can’t tell if there is also a mite problem starting. Best to take to an avian vet to be sure. Maybe others can see better if there are signs of mites starting. It’s good that you’re looking at these small details <img src="https://www.talkbudgies.com/images/smilies/smile.gif" border="0" alt="" title="Smile" class="inlineimg" />. I'm not sure if it's that, because our other budgie doesn't have any symptoms and they share everything. One more question..Are the mite sprays they sell at pet stores safe to use? No - please do NOT use mite sprays available from pet stores! What you need to use for mites is a spot-on treatment of ivermectin or Scatt which your Avian Veterinarian can supply when you go in with the budgie to have the cere checked IF it is needed. I'd definitely have her checked to ensure the thickening of the cere isn't causing problems with her breathing. Additionally, when one budgie has mites, all budgies need treatment. Okay, I thought I had read bad things about them.. Thanks!! Last edited by FaeryBee; 03-07-2019 at 07:09 PM. She doesn't have mites, but she does have a sinus infection. We got eye drops and antibiotics prescribed. Thank you all for the advice!! Last edited by FaeryBee; 03-15-2019 at 08:44 PM.